Insect and rodent infestations are a big problem in Windsor and Essex County. Infestations can be harmful to your health and can cause thousands of dollars in property damage if not dealt with properly. That's why as soon as you think you have an infestation problem you need to call the professionals. TRU PEST CONTROL is an award-winning, experienced, professional pest control solutions company serving Windsor and Essex County. Tru Pest Control has an understanding of pest biology, experience and creativity. We will work with you to stop pests before they jeopardize your health, safety, and property. When it comes to fumigation and extermination, experience matters. For over 33 years we have been proudly providing pest control and exterminator services to our community, throughout Windsor, Tecumseh, Belle River, Essex, Leamington, Kingsville, Harrow, Amherstburg, Lasalle, Wheatley and Stoney Pointe. We have thousands of satisfied customers and have gained an outstanding reputation for pest control solutions in the Windsor and Essex County area. We are committed to providing our customers personable, confidential service with fast and effective results. We offer a discrete service in both marked or unmarked vehicles. We offer economical pricing and affordable, preventative solutions to our customer's needs. 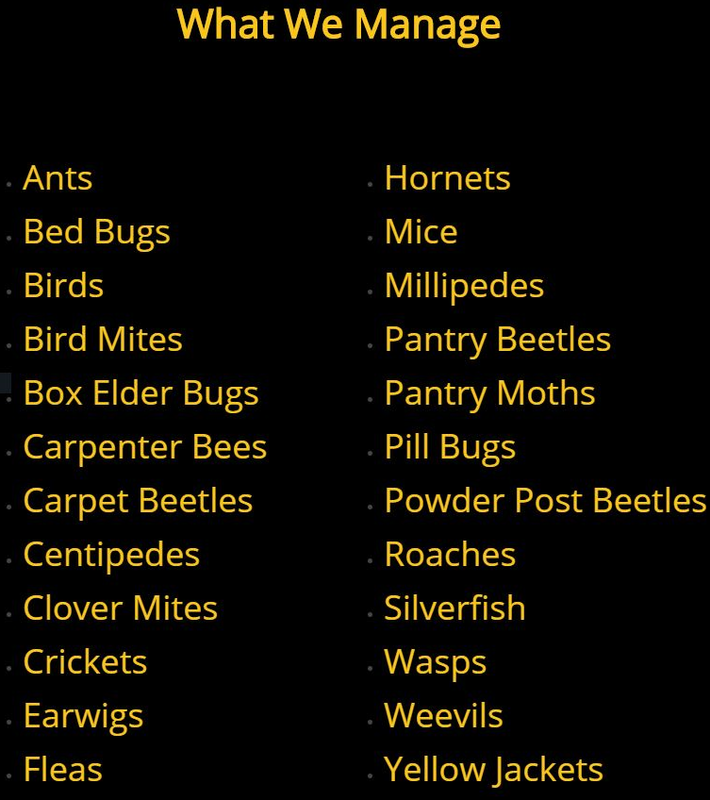 If you think you have an insect or rodent infestation problem, call us today. We offer a spider spraying service to ensure that you are fully protected from spiders both inside and outside your home. Contact us to find out about our spider spraying packages. We also offer group rates for neighbours who would like to use our spider spraying service. We take every precaution that our treatments are done to the strict standards set by the Pest Management Regulatory Agency (PMRA) and all manufacture labels, as listed for the intended use are followed. Time is of the essence when it comes to addressing a pest infestation. Being a Windsor owned and operated company we can provide fast and efficient response time that will fully meet our client's needs. Operating as a small Windsor based company this allows us to provide prompt and affordable prices to our customer while providing a personable honest service. We use unmarked vehicles during our customers visits to ensure that our customer privacy is guaranteed. We also ensure that all customer information and records are fully secured. We have fully licenced and qualified pesticide applicators to perform all structural insect and rodent control. We hold a valid operator licence to operate a pest control business in Ontario. We are fully insured to perform all work and are security background checked. We at Tru Pest Control are totally committed to exceeding customer expectations by providing an outstanding service in a professional manner with integrity, honesty and treating every client fairly. Call 519 948 3795 or use the form below to send us an email. Are you already a customer? We'd really appreciate it if you took a few seconds to leave us a Google review! Sign up for preventative tips, offers and updates.